Vancouver Asian Heritage Month Society is now accepting nominations for their annual Pan Asian Recognition Awards. 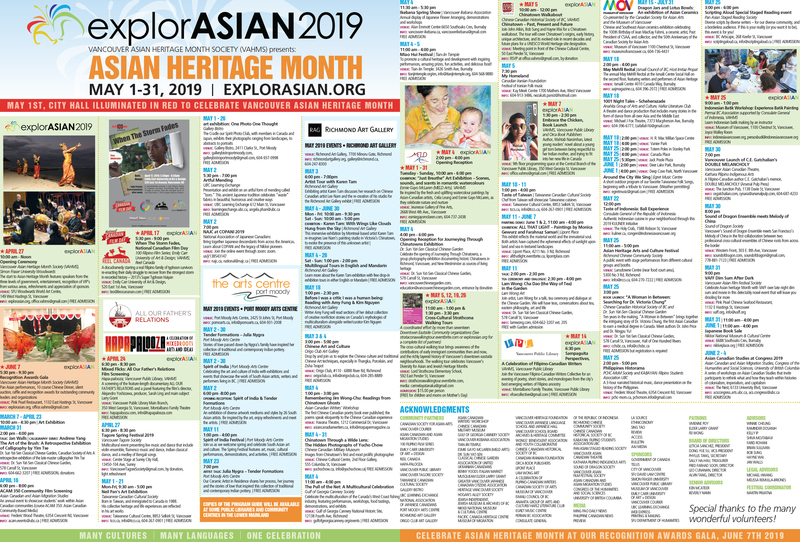 The Vancouver Asian Heritage Month Society’s annual Recognition Awards will recognize three individuals or community organizations from the diverse Pan Asian communities that contribute to the rich arts and culture we are privileged to enjoy. Honourees will be recognized at an Awards Ceremony at the explorASIAN Festival Gala event on June 2nd, 2018. The purpose of the awards is to: recognize and thank those individuals or organizations that have significantly contributed to the broader exposure of Pan Asian arts and culture in our community; celebrate cross-culture exchange; and, highlight those that may otherwise go unnoticed. Enhancement of multicultural identity or experience through cultural or artistic expression. Submission deadline is April 15th 2018. We look forward to receiving your nominations!